You might expect a record called Even In The Darkest Places to be - well, dark. Far from it. Even though trumpeter Colin Steele has clearly gone through some difficult times in the nine years since his last record, this CD is full of light and optimism. Steele's trials - a catastrophic loss of embouchure - since that last record have been well documented. Unable to play for a long while, he is vocal in his thanks for those who supported him as he worked to regain his "chops" - the track There Are Angels is dedicated to them, and Robin Song is named for the fan who helped finance this recording. 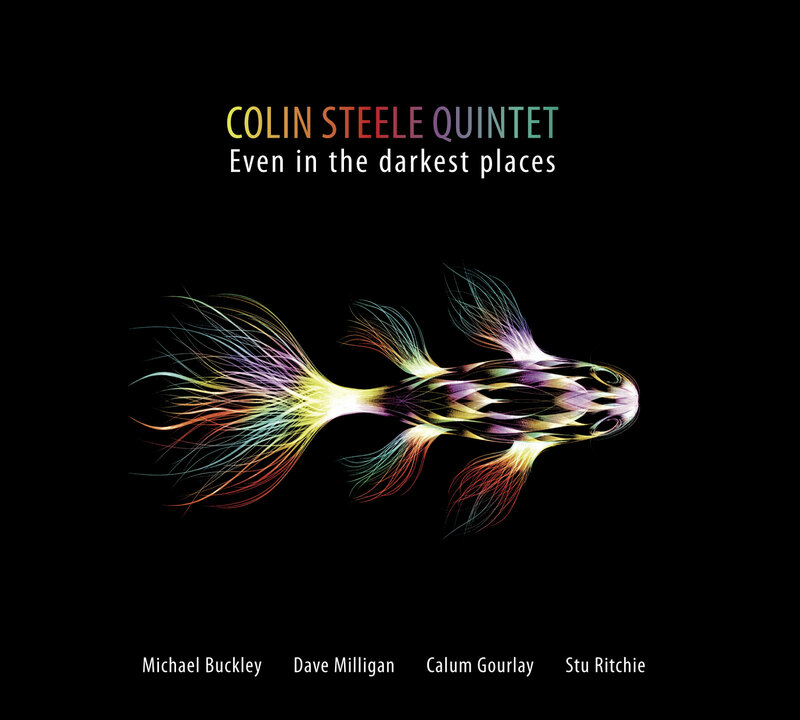 Steele has been gigging again for a couple years with this band, an international quintet of Celts: saxophonist Michael Buckley is from Ireland, Stu Ritchie on drums is now based in France, and bassist Calum Gourlay world from London, leaving only Steele and long term collaborator Dave Milligan in their native Scotland. Milligan, who arranged Steele's tunes for the band, a task he has taken on for all Steele's albums, is a hugely underrated musician: one of the many pleasures of this record is the opportunity to hear Steele and Milligan together again. Being in each other's company seems to bring out the musical best in them. In common with his earlier recordings, the music itself is firmly rooted in Scotland: this is jazz from the Celtic fringes, with a folk-influenced lilt. Looking For Nessie and Independence Song are inspired directly by Steele's experiences; the former has at its centre an engaging solo from Gourlay, as well as an energetic solo from Buckley's tenor. Independence Song sounds as if built on traditional melodies, and reflects the optimism Steele felt during the debate around the Scottish independence in 2014. It is an uplifting, hopeful tune which features a long emotionally rich solo from Milligan. Two other pieces, Suite for Theo and Down to the Wire, grew out of a commission for the Edinburgh Jazz Festival Big Band a few years ago. Steele's solo on Suite for Theo feels like a mature statement, dispensing with the fireworks of youth. Down to the Wire is also structured as a suite, its three sections interlocking to form a whole. Buckley's soprano has the air of the pipes in the first section whilst Steele's solo in the middle part has a slow building emotional intensity that is simultaneously optimistic and heartrending. The closing section has a fast solo from Milligan with exemplary, swinging support from Gourlay and Ritchie - Gourlay's speed-walking bass is insistent without being domineering. This record marks a very welcome return for Steele. His playing seems more mature (as well it might with almost nine years between recordings), but still exciting despite being toned down a bit, and his writing is compelling.